Funded by the 2018 Faculty Research Grant Scheme, the team of Roetzel, DeKay, Sakai Kidd, Zinkiewicz and Klas created the project "An Integral Sustainable Design Approach to Human Inhabitation of Architectural Spaces." The team ran a successful data collection workshop in March 2018 with Mark Dekay and Susanne Bennett, who joined the School as visiting scholars. This allowed the Deakin-based project team from the School of Architecture and Built Environment as well as the School of Psychology to collaborate with Mark on this project. The data collection workshop involved the recording of participants' subjective experiences of an architectural space using wearable cameras, measurements of indoor environmental parameters, semi-structured interviews and architectural analysis of the case study spaces. 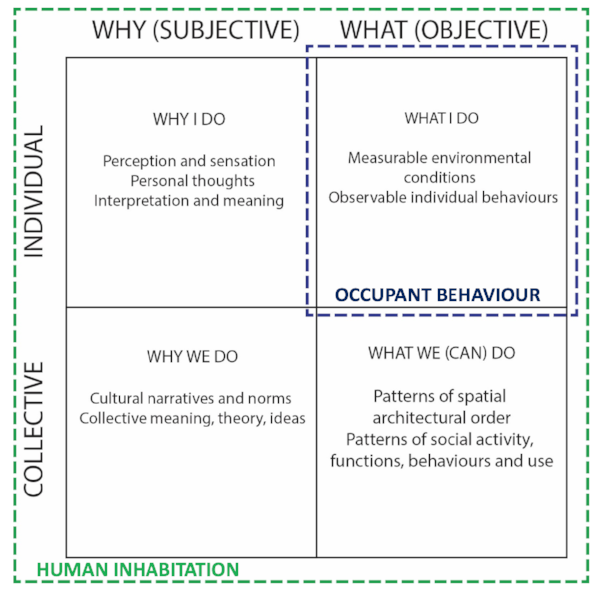 The data analysis is in progress and outcomes so far are preliminary results, and includes a first proposal for an all quadrant all levels (AQAL) approach to human inhabitation of architectural spaces, subsequently presented at the Integral European Conference in May 2018 in Hungary.